Here's a question that 1995-You may be very interested in: Can you copyright a mix tape filled with tracks not created by you, but that you meticulously curated? That's the basic question at the heart of a lawsuit filed in UK Courts against Spotify. The British dance music empire Ministry of Sound (MoS) has made a mint over the past two decades selling curated compilations, which have sold over 50 million copies to date. The songs featured on the well-regarded compilations are all legally licensed, but MoS does not own many of the digital rights outright, therefore artists are allowed to license their work separately to streaming venues such as Spotify. And that's where things get messy. Is a track order copyrightable? Like fellow Britons in Radiohead, MoS has opted not to license their compilations albums to services like Spotify, being of the opinion that record labels don't get a fair shake out of the relationship. Of course, many of the tracks from MoS' compliations independently appear on Spotify where they are available for listening for free by any user. Spotify allows users to create their own publically searchable playlists of songs culled from the platform's vast library of streamable tracks. Given that freedom, some Spotify users have recreated MoS' compilations as Spotify playlists, often incorporating the "Ministry of Sound" name into the title. 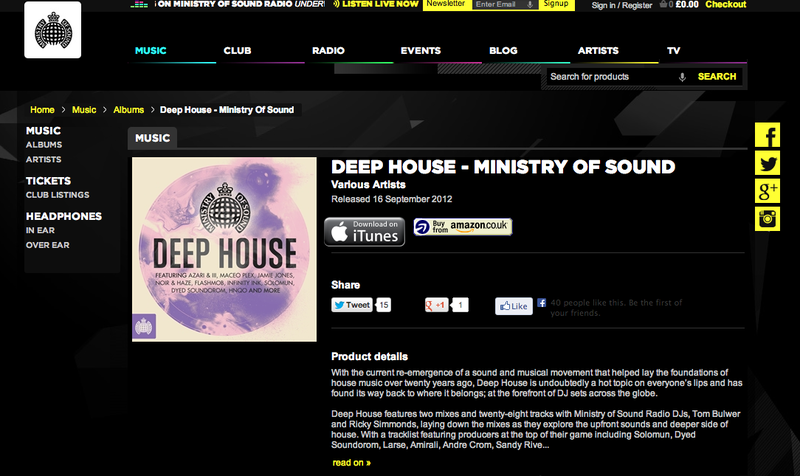 For example, a very quick search through Spotify turned up the user-curated playlist "Ministry Essentials: Deep House" (Spotify link), which happens to have many of the same tracks on MoS' compilation Deep House – Ministy of Sound. The playlist and official compilation are not exact matches (in fact, the Spotify playlist has quite a few more tracks), but there is a lot of crossover. Therefore, a consumer has a choice between accessing the Spotify playlist for free or purchasing the album for £6 (around $9.38) on Amazon or $10 on iTunes. Unlike the tracks' artists, MoS does not receive any royalties generated from Spotify's revenue stream. In an op-ed appearing in The Guardian, MoS chief executive Lohan Presencer commented "You won't find our compilation albums on Spotify. Why not? Because its business model does not recognise that our products have any material value. It doesn't consider them worth licensing." 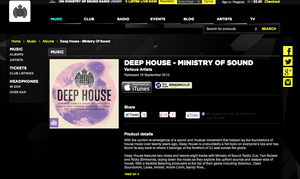 Just some of the "Ministry of Sound" playlists currently available on Spotify. Mr. Lohan went on to explain why his record label has opted to sue Spotify in a case currently working its way through the UK courts. "Users of the service were copying our compilations. 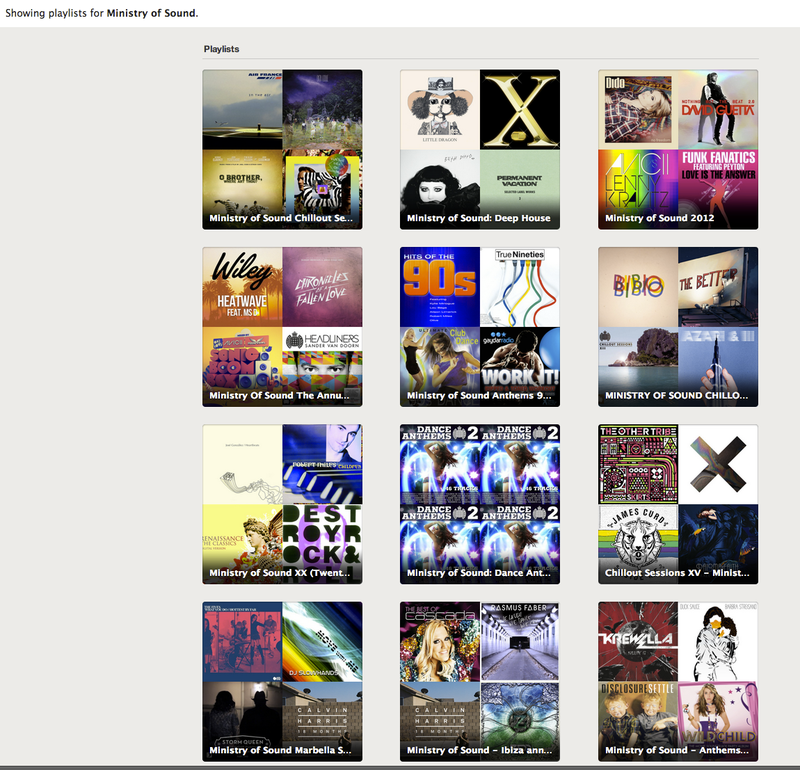 They were posting them as their own playlists and calling them 'Ministry of Sound'. We assumed it was an oversight on Spotify's part and contacted the company to request it remove the offending playlists. It declined, claiming there was no infringement and it wasn't its responsibility to police its users." A representative from Spotify commented to us via email with the following non-response response: "Spotify's goal is to grow a service which people love and ultimately want to pay for. Every single time a track is played on Spotify, rights holders are paid - and every track played on Spotify is played under a full license from the owners of that track. We want to help artists connect with their fans, find new audiences, grow their fan base and make a living from the music we all love." While there is undoubtedly lots of thought that goes into curating MoS' various compilations, free music streaming may be one of those disrupting technologies that demotes the importance of "experts" because everyone can be an expert now. And users are free to choose which experts to follow. At the same time, a user on any site would not be able to upload non-original material and pass it off as their own—and certainly not when comandeering the name of an established brand. But is a curated track list—even one that is merely similar—subject to copyright? While this particular case is being worked through the UK court system, "US law does provide some protections for compilations, but it is limited," says Corynne McSherry, Intellectual Property Director for the Electronic Frontier Foundation. "One may have rights in the compilation itself, if its original and creative, but not the underlying works." Under US law, MoS might have reasonable expectation for Spotify to promptly remove material following a takedown request under the Digital Millenium Copyright Act (DMCA), but their name is probably too broad to be considered a protected phrase. "Under the DMCA, service providers get protection from secondary liability for the acts of their users if they response promptly to takedown notices," says McSherry. "So they have strong incentives to complaints of infringement, whether legitimate of not. Copyright protection does not extend to the name 'Ministry of Sound.' I suppose they might try to make a trademark claim, but I think there'd be a strong fair use argument under U.S. law". The law has long been woefully behind the current state of technology, but it's cases like these, which force it to catch up.